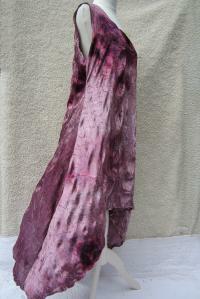 Long flowing Fairy-Dress, made from a crincle-velvet in various shades of berrycolors. A very comfy dress, which emediatelly draws attention because of its unusually fabric and the lovely flowing shape. an beautiful, comfortabel dress for every occasion!